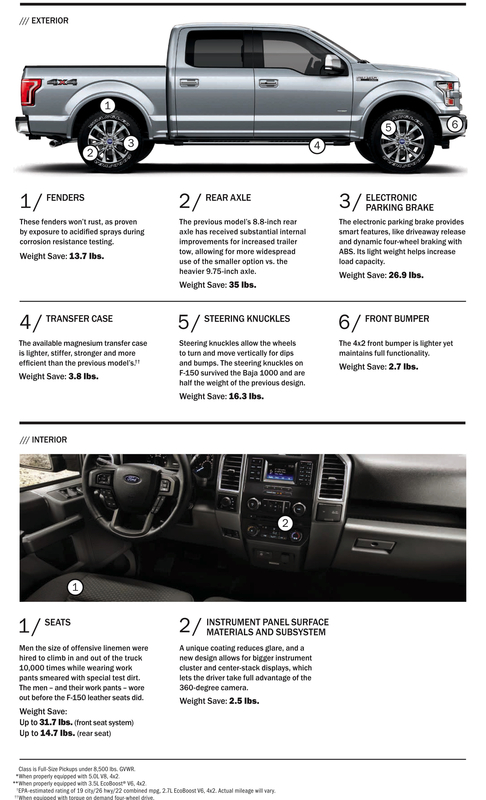 Where Exactly Did the 2015 Ford F-150 Lose Its Weight?? Losing weight without sacrificing durability… that’s the dream of every truck manufacturer out there. Last year, as we all know, Ford hit the jackpot on that very dream with their new F-150, slashing the overall weight of the truck by over 700 pounds. That’s a huge number in the ultra-competitive truck world! 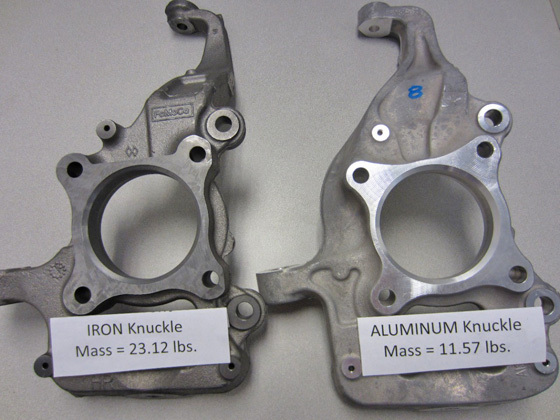 Ever since Ford announced this drop in weight, everybody’s contributed it to one thing: their switch to aluminum. And that’s true; some of the weight drops are directly tied to the aluminum switch. However, it wasn’t just that simple, either. Some of the weight drop can also be contributed to their use of technology and just being smarter and more innovative in their approach. The Rear Axle— Ford managed to slice off 35 pounds in rear axle weight. They did this by making substantial improvements in strength to the truck’s 8.8-inch option, allowing customers to bypass the bulkier 9.75-inch option. The Seats– Somehow, Ford found a way to cut out a possible 46.4 pounds from their seating arrangement. Of course, if you only have a one-row truck, then this savings is only at 31.7 pounds. The Electronic Parking Brake– This was a big-time savings for Ford. These electronic brakes utilize smart features, like driveway release and dynamic 4-wheel braking, to shed weight and lighten the truck’s load. Total savings… 26.9 pounds!! With these changes, Ford has now set a new precedent in pick-up truck weight and efficiency, leaving the other major automakers in a scramble. Of course, that’s nothing new. The F-150 has been dominating the market for decades, and I bet as soon as the others catch up in weight, Ford will be ready to take-off with more industry-leading innovations. This entry was posted in Culture, Ford and tagged aluminum, f-150, ford, Losing weight, lost weight. Bookmark the permalink.